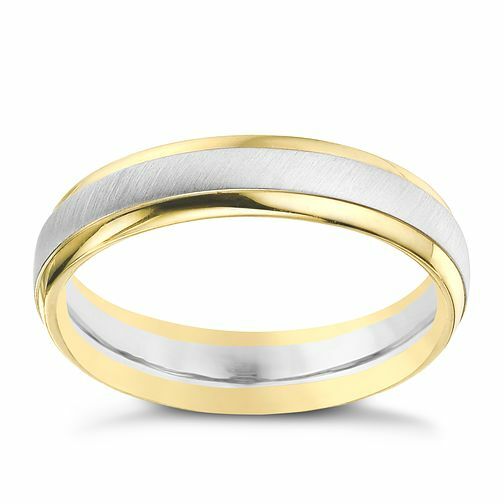 Get the best of both worlds with this 5mm wedding ring featuring 9ct white gold matt centre and 9ct yellow gold polished edges. 9ct yellow & white gold 5mm matt & polish ring is rated 3.5 out of 5 by 2. Rated 2 out of 5 by Anonymous from Do not buy Bought less than 2 years ago.have had to have it re-rodium plated 2 times first lasted 10 months-second 4 months.now needs doing again -5months.very disappointed.do not feel this this is acceptable for a wedding ring. Rated 5 out of 5 by Anonymous from really well made/engineered ring Great ring! my fiance and myself have bought these rings for our wedding and we love them. They are so classy on the finger - very well made 2 tone ring, which feels very comfortable and easy to wear, yet substantial. We looked at the 18ct version of the same ring but this was by far the better of the two. Because of the two tone effect, it means that either yellow gold or white gold engagement/eternity ring can be worn with it. I really would recommend this ring - Im very impressed and Im not easy to impress!